If you're only focusing on push notifications with your MMA solutions, you're leaving a lot of money on the table. We've got the inside story on the features used by the most successful mobile app teams ... and which vendors deliver those features. We'll also talk to industry insiders on how they're using MMA in ways you might not have thought of. We surveyed 375 mobile developers with over 900 million monthly average users, analyzed 1.8 million apps in Google Play and the iOS app store, conducted 17 live interviews, and surveyed 19 MMA providers to find answers to these questions. 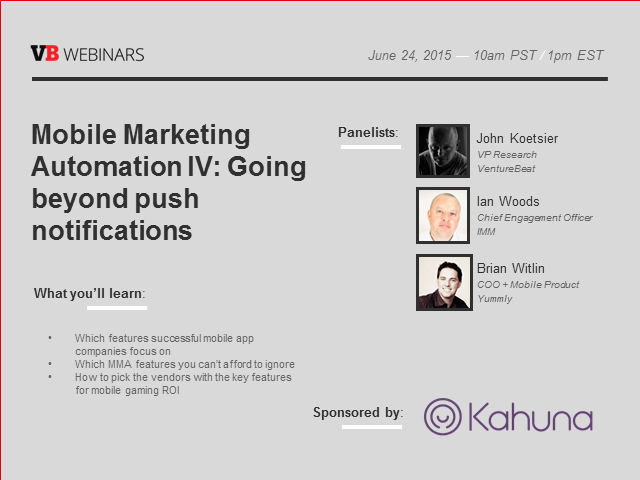 Join us to learn how to successfully leverage mobile marketing automation to your advantage.